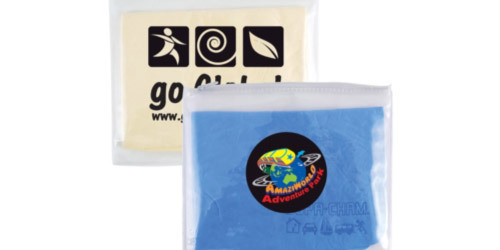 Synthetic pre wet body towel/chamois with rounded corners, cello bagged in clear PVC pouch. Chamois supplied with "Supa Cham" debossed logo as standard. Store Supa Cham in pouch when moist/ damp to ensure longevity and reusable application on cars, boats, vans and bodies.